Make a fun game for counting, colour sorting and fine motor skills coordination using rainbow cardboard tubes and coloured pom poms! 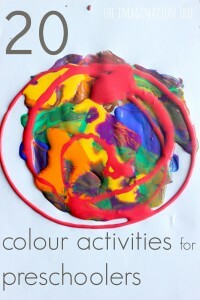 A great indoor or outdoor play activity for toddlers and preschoolers to enjoy again and again. 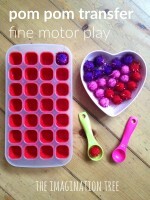 Here’s the latest in our Toddler Play series, although so many of these ideas are applicable to all ages and mine have all joined in at various stages with each one! 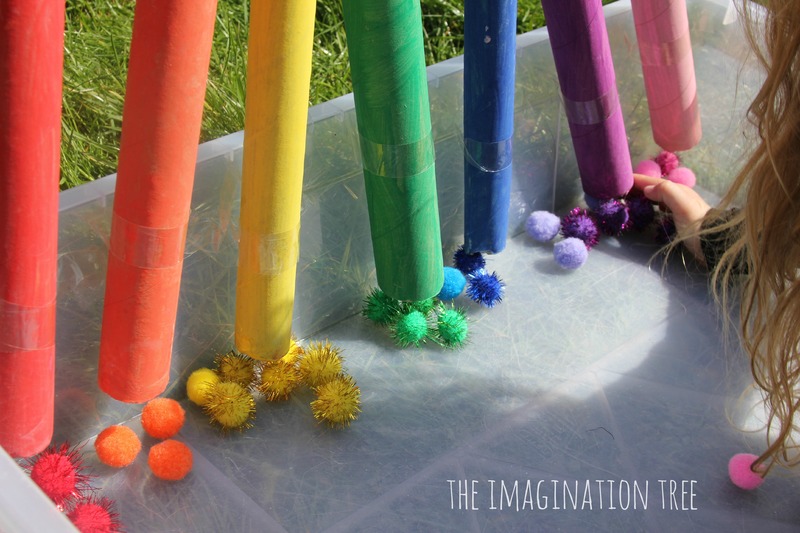 We painted some long wrapping paper tubes in rainbow colours and left them to dry. When they were ready we stuck them to the inside of a large, under-bed storage box (from Ikea), using sticky tape. 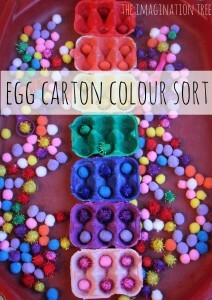 Then we filled the tub with lots of plain and sparkly, colourful pom poms to match the colours of the tubes, and added some large tweezers for easy grabbing. 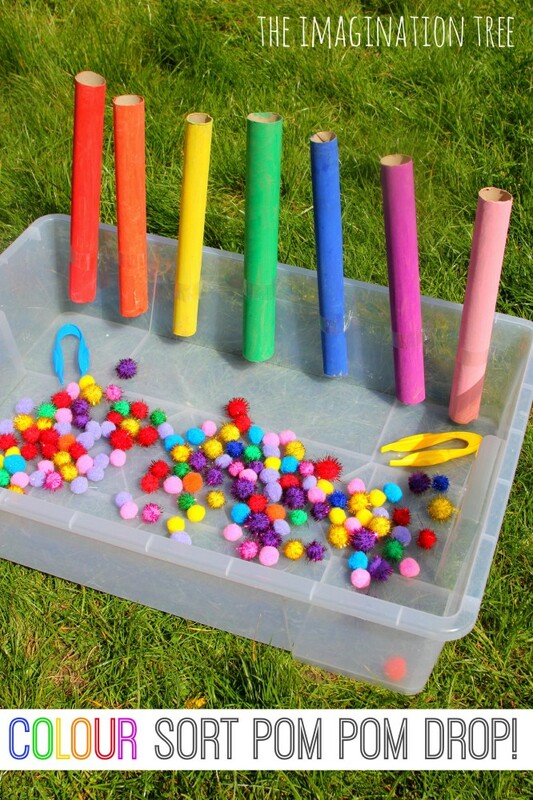 My eldest was the first to be desperate to play and loved using the tweezers to drop the pom poms down the tubes and count them as they piled out of the bottom! 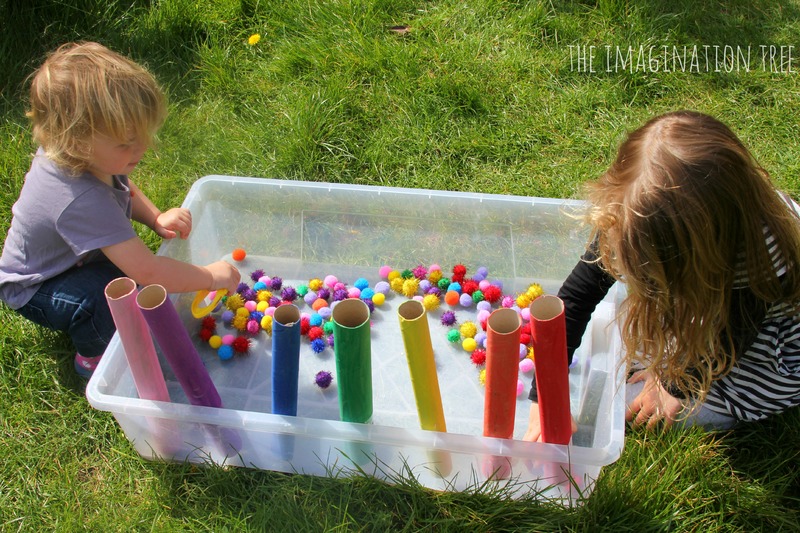 This activity reminds me of one of the first Discovery Boxes we put together for open-ended play with very similar materials, when she was just 3. That play lasted for days and was constantly evolving and makes a great additional activity to pair with this one. 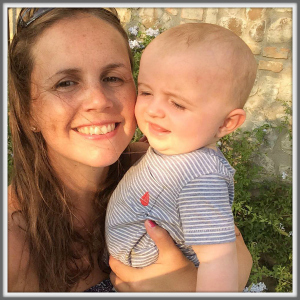 Her littlest sister, always keen to copy, came along and played too, even having a go with the tweezers with some control and coordination, (using both hands at this stage.) I love her little tongue-out-in-concentration face here! She matched some colours and others she just enjoyed posting and watching the cause and effect of the pom pom entering then leaving the tube, with lots of joy! 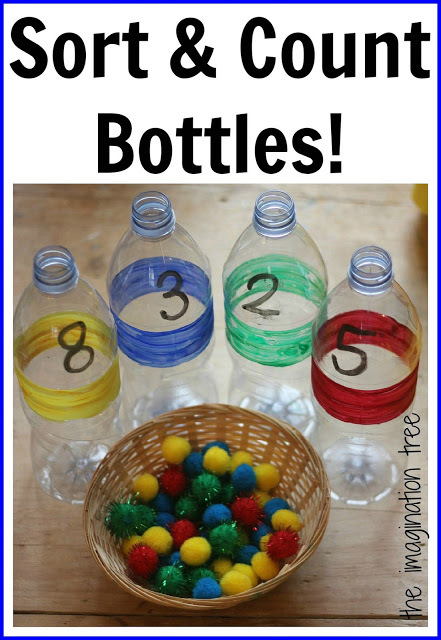 This would be very easy to extend for other learning intentions such as counting, matching the correct number of pom poms to the numerals, addition and subtraction. 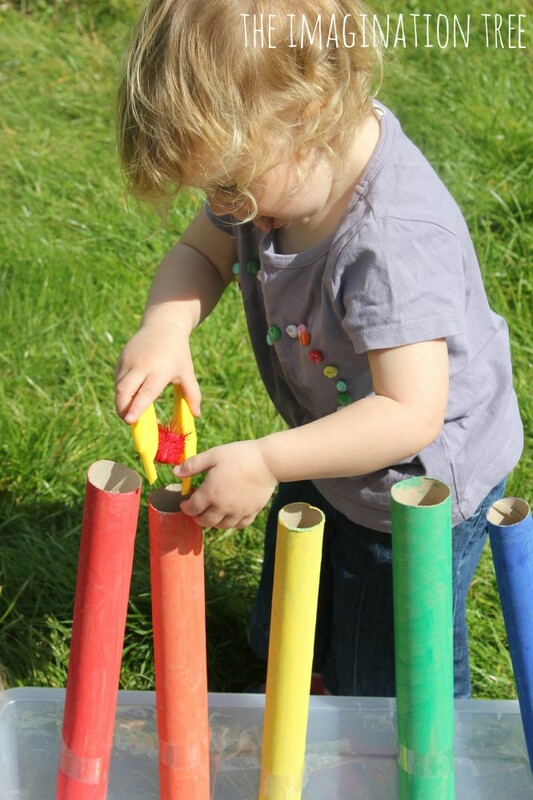 Follow your child’s lead and interests to see how the activity could progress, and when they want to move on then dismantle the pieces and re-use it for construction materials and loose parts play! 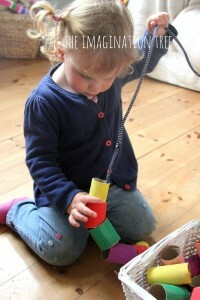 Here’s one of the ways we re-used these tubes as giant beads for play, stacking and threading! 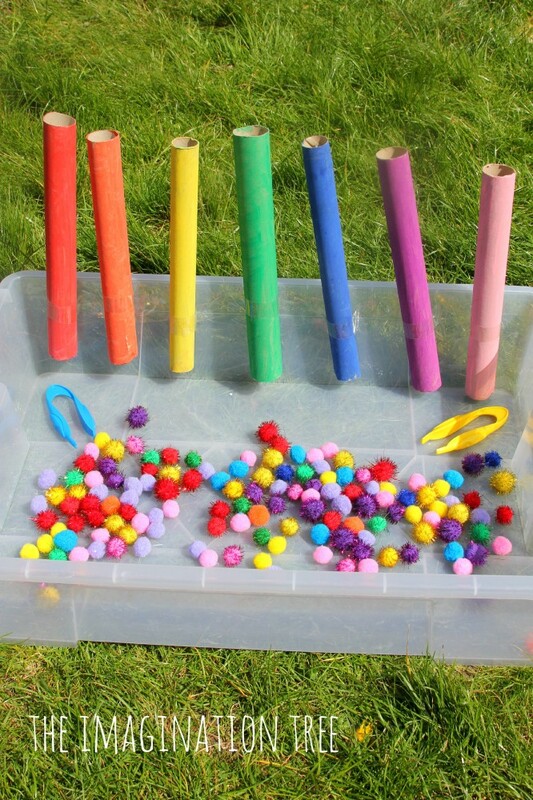 You will may like this Pom Pom Drop and Shoot Game too! 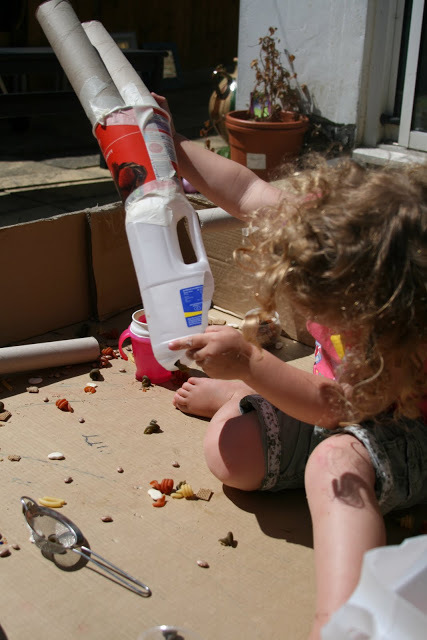 Discovery box with beans, tubes and tape! 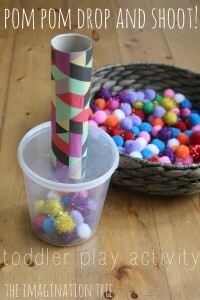 Fine Motor Game for Preschoolers: Pom Pom Races! Brilliant! So simple and so fun. 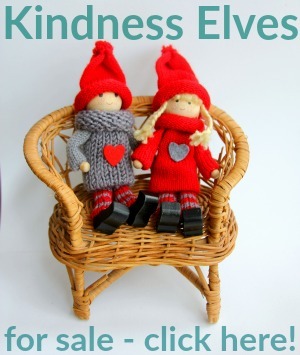 I just recently came upon your website and absolutely love all that you share. Thank you so much. Hi, where do you purchase the tweezers? 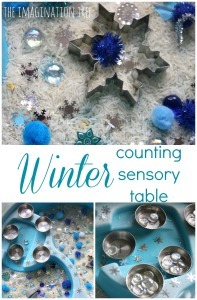 Looking forward to trying this activity! 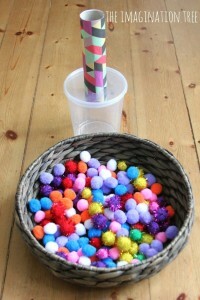 Pom Pom Drop Game is really so exciting for my child and colorful bolls are looking fabulous. This looks like fun. Where do you get the pompoms from or what’s the right name to search for them as? Thanks. Where can I find the tweezers?